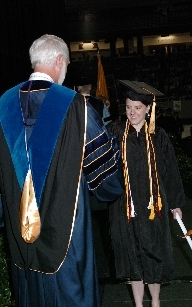 I am a two-time graduate from Georgia Tech specializing in science and technology policy for my Master of Science and also earning my Bachelor of Science in Public Policy with minors in Law, Science & Technology and Computer Science. My studies mostly involved the interplay among public policy, law and technology, particularly as it pertains to computing and privacy issues such as intellectual property, information security and questions of jurisdiction on the internet. My graduate capstone explored the concept of using computer algorithms to draw Congressional districts and applied the idea using Utah as a case study with methods developed by the redistricting subteam of the e-Democracy Vertically Integrated Projects group. I have worked as a research analyst for the Georgia House of Representatives and for the Office of Policy Analysis and Research (OPAR) at GTRI. I have also worked as a research assistant for professors in the schools of Electrical and Computer Engineering and Public Policy at Georgia Tech. As an analyst, it was often my job to act as a “translator” of sorts between scientists and legislators by explaining technologies and scientific concepts in simple terms to lawmakers and explaining the legislative process and relevant laws to scientists and engineers in equally simple terms. As an assistant, I often worked with large data sets and sometimes would compile lists of information about agencies and committees for later use for contact or analysis. As you might imagine, my internet research skills (colloquially referred to as “Google-fu”) are very strong. In my study of computer science, I also developed an interest in and a certain knack for user interface design, discovering that there are many parallels between designing a good user interface and explaining complex technological issues to politicians (or politics to engineers in a lab). Both actions strive to maximize accessibility to something complex. It’s incredibly satisfying to finally see something “click” in the mind of someone who thought that he could never understand or use something previously thought to be too complicated. My hobbies include photography, writing, obsessively keeping up with current events and working on computers when they’re not actually broken. I recently got my first DSLR camera, a Canon 450D, and many of my photos can be found on my Flickr. I occasionally still use my old point-and-shoot Sony camera, but it doesn’t always like to work anymore. I wrote and edited for the Technique for five years, and I’ve done freelance writing since I was 16. I am also a fairly regular contributor to the English Wikipedia, where I have over 3,000 edits on a variety of topics. I find that editing Wikipedia helps me to both exercise and improve my research and writing skills, and I generally find it very enjoyable, as I am always learning as I do it. 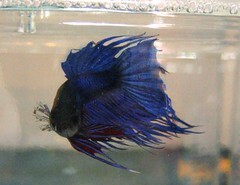 I am an avid fishkeeper, though I wouldn’t call myself an aquarist, as I only keep Bettas. I have both males and females, but I don’t breed them because I can’t currently afford the equipment, and I don’t really have the space. I really love Bettas, and it makes me sad that they don’t always get the treatment and respect they deserve as pets who are beautiful, intelligent and relatively easy to take care of. I have kept Bettas since I was 17, and I have had as many as nine Bettas at one time. Properly taken care of, Bettas typically live more than three years; some can live as long as nine years, according to some sources. I also enjoy science fiction, watching other people play video games (and occasionally playing them myself) and spending time with friends. Surprisingly (or maybe not), these things intersect more often than you’d think. I often get together with friends to watch Star Trek, and I attend Dragon*Con and MomoCon every year. 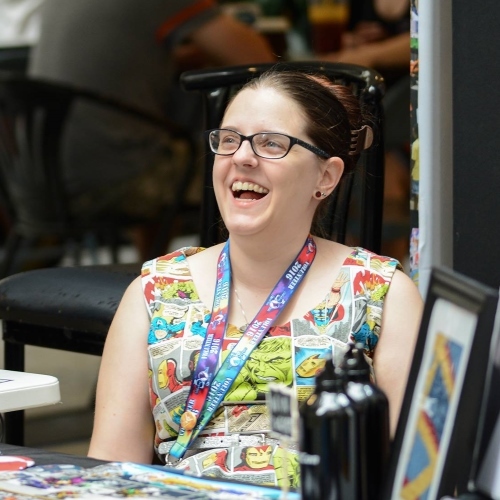 I find that conventions are a great place to network and learn as well as a great place to have more fun with thousands of your closest friends than most can imagine. Finally, I would be remiss in not mentioning the Electronic Frontier Foundation (EFF). EFF is an organization that I strongly support; they are often the first line of defense for “freedoms in the networked world…defending free speech, privacy, innovation and consumer rights.” Their newsletter is incredibly informative for anyone who considers themself as an informed technological consumer and anyone who is interested in the intersection of law, policy and technology.